Hate to admit it but I'm a messy eater. As careful as I try to be always seem to spill or drop something on myself while eating. So when it comes to Thanksgiving dinner it is not a question of if I'll spill something on my clothes but rather what it would be. Apparently I'm not alone though as NOVOZYMES, the world's largest provider of enzyme and microbial technologies used for such things as improving crop yields, increasing the efficiency of washing clothes, and providing reliable renewable fuels, sent A Geek Daddy some tips for people to deal with the tough stains found on clothes after a Thanksgiving Dinner. "Thanksgiving is lovely, but it can prove dangerous to our clothes because of the meal," noted Leigh Murphy, a scientist with NOVOZYMES. When it comes to cleaning up messes, Leigh is an expert as he works to develop enzymes for use in laundry detergents meant to remove stains. Each year, he examines and experiments on thousands of different stains. "The toughest Thanksgiving stains are gravy, cranberry, and pumpkin," Murphy noted. "But luckily, good washing advice and having a stain removal process in place will help to get clothes fully clean." Gravy: Rub a small amount of liquid dishwashing soap into the fabric. Rinse and pretreat the stain with a laundry stain remover. Launder. Cranberry: Flush the stained area with cool water, make a solution of half a teaspoon of liquid laundry detergent, mixed with a tablespoon of white vinegar and a quart of cool water. Let the stained fabric soak in this solution for 15 minutes. Rinse and launder. Pumpkin: Remove any excess pumpkin pulp, and run the fabric inside and out, under cold water to flush out as much of the stain as possible. 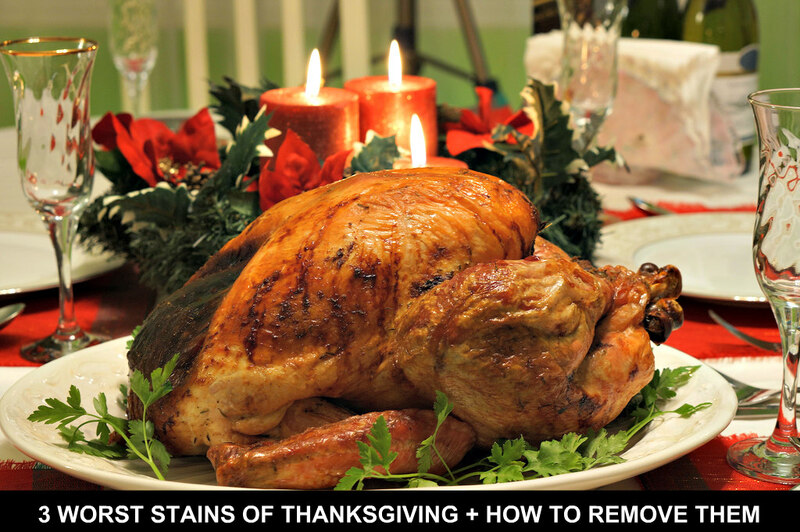 Pretreat the stain with a laundry remover. Launder. So there you have it! Tips from a stain expert for messy eaters like me! Stains won't ruin your day when you take advice this advice from NOVOZYMES scientist Leigh Murphy. Happy Thanksgiving everyone!